Showing 36 articles from February 12, 2013. School safety concerns have generated “as many telephone calls . . .as any issue I’ve had to deal with,” Franklin County Schools Supt. 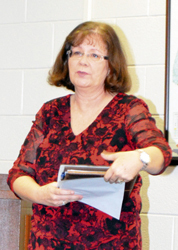 Eddie Ingram told the Board of Education Monday night, launching a discussion of the challenges and options facing the district. “The Sandy Hook Elementary School event (a mass shooting of children and staff) makes us all step back,” Dr. Ingram continued. It’s now officially a two-person contest to fill a vacancy on the Franklin County Board of Education -- and a decision about who will fill that vacancy could come as early as next month. On Monday night, Rosemary Champion officially entered the contest, adding her name to that of Dr. Elizabeth Keith in the effort to secure the seat that represents District 3 in the northern part of the county. LOUISBURG — Franklin County’s free clinic needs some help, so they’ve called upon one of college basketball’s most renowned assist men. Franklin County Volunteers in Medicine Executive Director Beverly Kegley said they are joining forces with the Phil Ford Foundation to bolster local donations. 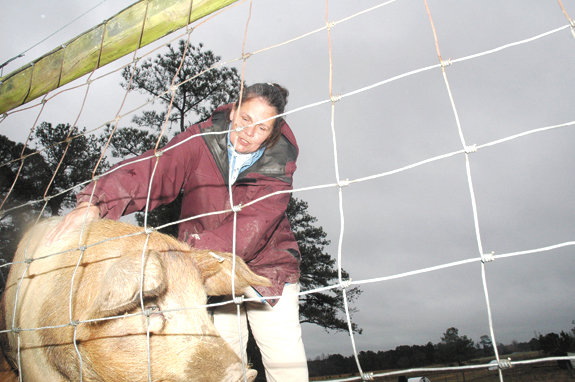 LOUISBURG — Just more than three years ago, Ranell Bridges had a full-time job and was a part-time farmer — not equipped with the greenest of thumbs. Now, though, her thumbs are more likely to be covered in dirt, mud or worse as she’s given up the office to run a 10-acre farm, full time. The county’s Cooperative Extension office has been an incredible resource, Bridges said. 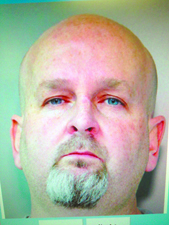 LOUISBURG — A drug sting last month is continuing to pay off in arrests, snaring a Granville County teacher in the process. Franklin County narcotics officers, agents with the State Bureau of Investigation and Granville County deputies executed a search warrant at a home in the 7700 block of N.C. 96, arresting Roger House following the Jan. 23 incident. GOOD MORNING: EVEN STEVEN! I see where South Korea has succeeded in placing a satellite into orbit for the first time last week, joining an elite club of space technology leaders seven weeks after the successful launching of a satellite by its rival, North Korea. Bleak economic news a ‘canary in coal mine’? 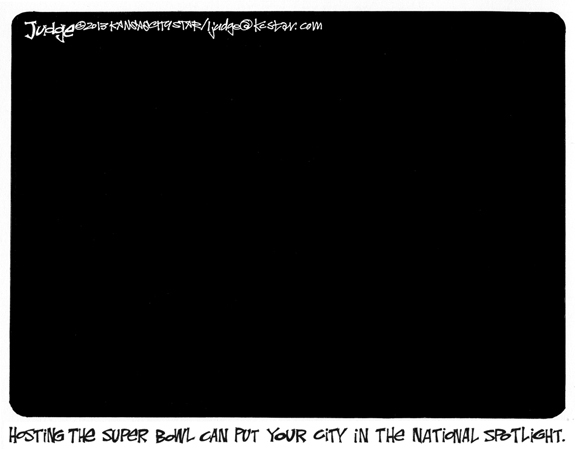 Let’s hope that last week’s news wasn’t the proverbial “canary in the coal mine” as far as the local economy goes. For those of you who grew up in the digital age, canaries (the little birds now sold in pet stores!) were once kept in cages deep in the bowels of coal mines to help determine if the air was safe for miners to breathe. I usually don’t stick my hand in a hornet’s nest or poke the bear. 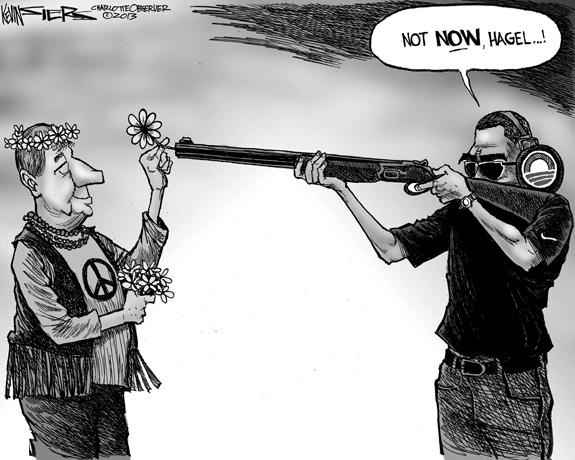 But it’s hard to talk about the gun control debate without doing just that. Most recently, our Franklin County Board of Commissioners found themselves in the spotlight of the debate. FRANKLINTON —Mary Frances Bridges, 91, died Thursday, Feb. 7, at Louisburg Nursing Center. A memorial service will be held at 3 p.m. today (Wednesday, Feb. 13) in the chapel of Hall-Wynne Funeral Service in Franklinton, with the Rev. Clyde Waiden presiding. Friends may visit with the family following the service. CHARLOTTE - Wilson Perry Tucker, 85, husband of the late Ruth Ball Tucker, died Thursday, Feb. 7, 2013. Funeral service was held Sunday, Feb. 10, at Trinity Church of the Nazarene in Charlotte, with Pastor Mike Barefield officiating. Interment with Military Honors was held Monday, Feb. 11, at Forest Lawn West Cemetery. LOUISBURG - Joe Perry Dement, 85, widower of Wilhelmina Clark Dement, died Friday, Feb. 8, 2013 at his home. A member of Centerville Baptist Church, funeral services were held there Monday, Feb. 11, with the Rev. Aaron Land officiating. Interment followed in the church cemetery. LOUISBURG - Harlow Akie Pearce, 77, died at UNC Hospital on Sunday, Feb. 10, 2013. A funeral service will be held at 3 p.m. today (Wednesday, Feb. 13) at L. Harold Poole Funeral Service, 944 Old Knight Road, Knightdale. Burial will be in the Rolesville Baptist Church cemetery. LOUISBURG - Willamena “Snooky” Morris Bond, 92, died Monday, Feb. 11, 2013, at her home. A funeral mass will be held Thursday, Feb. 14, at 10 a.m. at Our Lady of the Rosary with Father John Raharjo officiating. 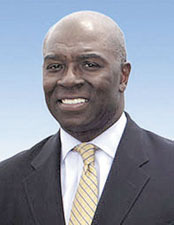 FRANKLINTON - Richard Gamble Bryant, 57, of Franklinton, formerly of Cary, NC, died Thursday, February 7, 2013 at Wake Forest University Baptist Hospital in Winston-Salem, NC. TARBORO - Thomas “Tommy” H. Keel, 84, passed away Sunday, February 10, 2013. FRANKLINTON – Carolyn Little McKenzie, 60, died Monday afternoon. QUEST FOR VICTORY. 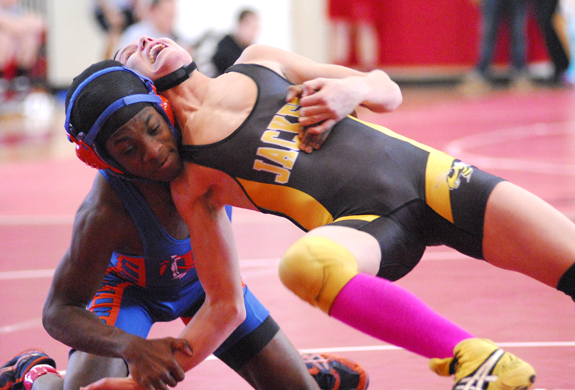 Franklinton High School’s Dominick Cotton (left) earned this victory as part of last Saturday’s action at the Northern Carolina Conference Wrestling Tournament at the FHS Gymnasium. FRANKLINTON -- Even with Corinth Holders’ year-long dominance, there was still some room for a handful of Franklin County wrestlers on the medals podium at the annual Northern Carolina Conference Wrestling Championships. 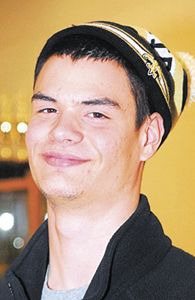 The Pirates, who swept through the team portion of the NCC in the regular season, boasted eight individual title holders at last Saturday’s event at the Franklinton High School Gymnasium. GAINES GOES STRONG. 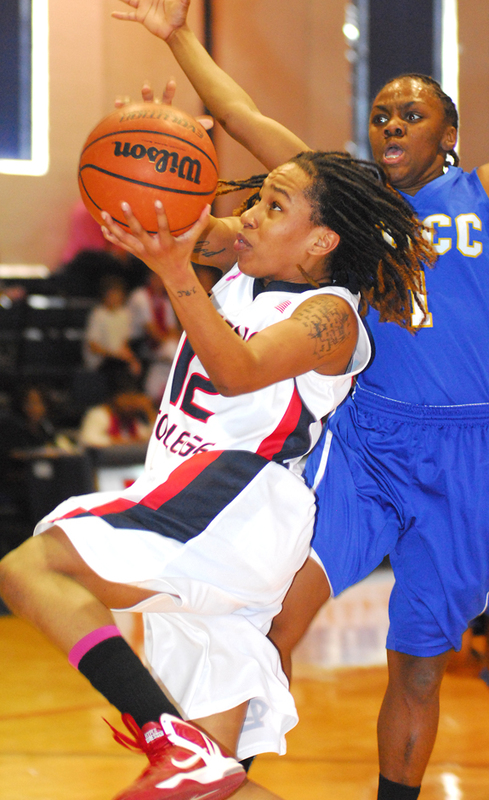 Louisburg College guard Olivia Gaines (left) drives for two points last Saturday afternoon against Patrick Henry Community College. 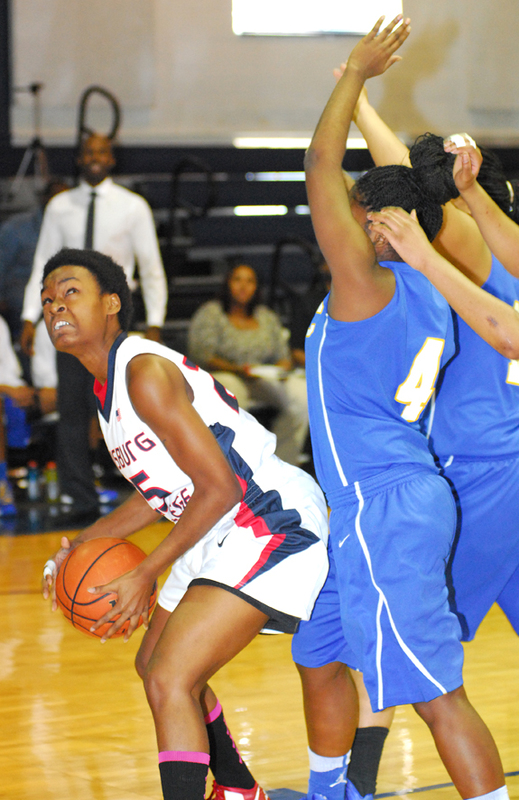 LOUISBURG -- In some instances, opponents have found a way to stay close to the Louisburg Lady Hurricanes for a brief period of time. But eventually, LC’s talent, depth and tenacity usually wear down a foe. Because of that intangible, the Lady Hurricanes have dropped just one game all season and are currently the No. 1 ranked team on the Division II National Junior College Athletic Association level. AND THE WINNER IS. 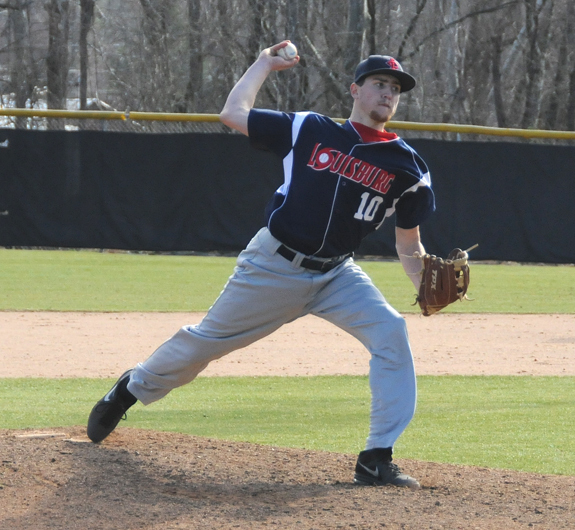 Jeremy Coburn picked up the mound victory for Louisburg College on Sunday afternoon against Catawba Valley CC at Frazier Field. LOUISBURG -- Thanks to a strong mound effort from Jeremy Coburn, the Louisburg College baseball team earned a 6-0 decision over #8 Catawba Valley CC Sunday afternoon at Frazier Field on the LC campus. With the win the ‘Canes drop the series 2-1, but they earn their first win of the 2013 campaign. Coburn, a sophomore who prepped at Louisburg High School, got the start where he threw a strong six innings, earning the win. THE LEAGUE LEADERS. Whitney Bunn helped the Bunn Ladycats stay atop the Northern Carolina Conference standings last Friday with a home decision against league foe Roanoke Rapids. 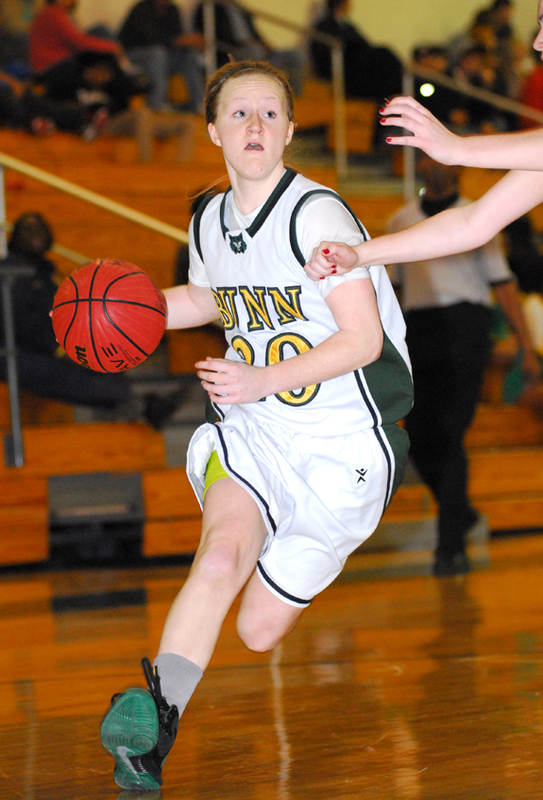 BUNN -- Heading into the final week of the regular season, the Bunn Ladycats are just one win shy of picking up their fourth consecutive Northern Carolina Conference championship. The Ladycats moved to that position following last Friday’s 61-37 home victory over Roanoke Rapids at the Bunn Dome. WINTERVILLE -- The Louisburg College men’s basketball team defeated a hot Pitt CC, 102-79, in a road Region X game last Saturday afternoon. LC outscored the Bulldogs 50-35 in the first half and the two teams had a closer second period with LC again outscoring PCC, 52-44. SOPHOMORE SLUGGER FOR LC. 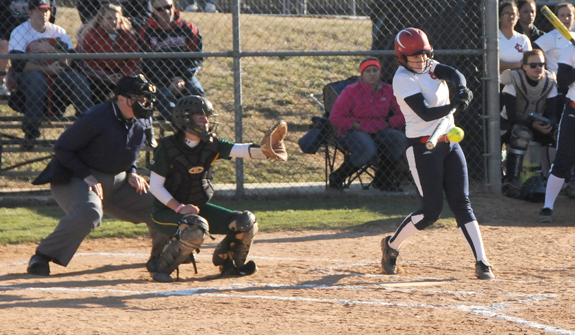 Franklinton native Morgan Tharrington (right) is expected to be an impact player as a sophomore this season for the Louisburg College fast-pitch softball squad. LOUISBURG -- There is always a learning curve when a coach moves to a new league, regardless of the sport. Louisburg College softball skipper Don Stopa was quick to process knowledge from his first year in charge of the Lady Hurricanes’ program. STARS OF THE NCC STAGE. Among the Franklin County performers at last Saturday’s Northern Carolina Conference Wrestling Championships were Louisburg’s James Harris (right). STARS OF THE NCC STAGE. 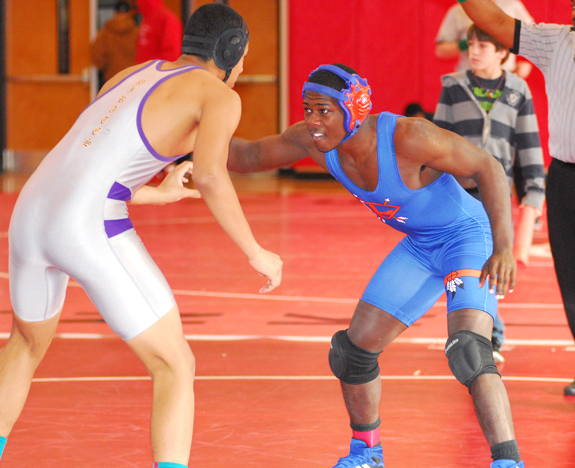 Among the Franklin County performers at last Saturday’s Northern Carolina Conference Wrestling Championships were Louisburg’s Darrian Brown (left). 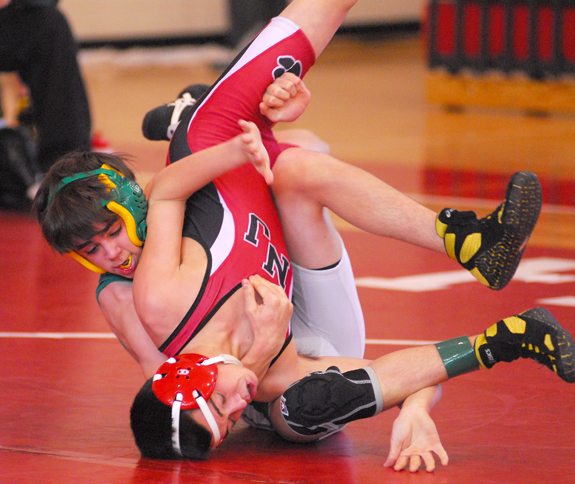 Bunn’s Josh Terlizzi (background) uses a nifty hold to take control of his match against a North Johnston foe at last Saturday’s Northern Carolina Conference Wrestling Chamiponships, which were staged at the Franklinton High School Gymnasium. Louisburg College guard Tiffany Johnson prepares for a driving shot attempt during last Saturday afternoon’s home victory against rival Patrick Henry Community College. 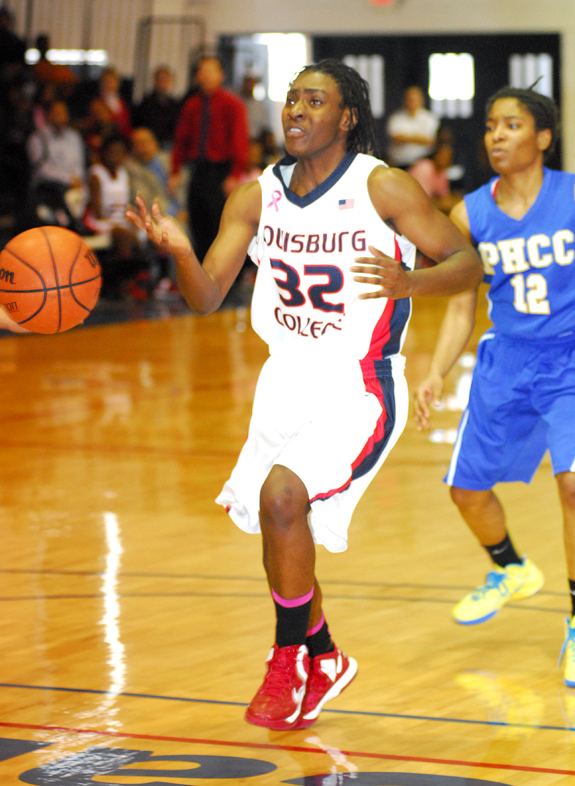 Jazmine Parker’s (left) strong inside play helped the Louisburg College Lady Hurricanes take an early lead during their home triumph last Saturday afternoon against league foe Patrick Henry Community College. LC is currently ranked No. 1 nationally. 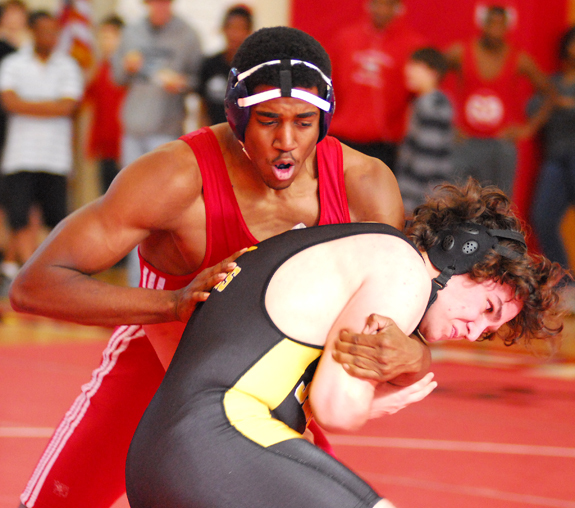 LHS’ John Cuddy (right) earned third place in his weight class during last Saturday’s mat action. A local couple who met at the Youngsville McDonald’s will exchange vows there on Thursday. Harold Strother and Peggy Killian met at the fast food restaurant, according to company officials, and have decided to tie the knot there. The couple, according to McDonald’s, quickly went from singles to soul mates. BUNN — Four people were treated for injuries sustained in a head-on collision Monday night. According to the State Highway Patrol, Christian Sledge was driving north on Sledge Road near N.C. 98 at about 8:20 p.m. when he ran off the road. He over-corrected, according to reports, and crashed head-on into a minivan. Through the weekend, firefighters had responded to two blazes. No injuries were reported in either conflagration. The evening of Feb. 8, crews from Louisburg and Mitchiner’s Crossroads responded to a house fire in the 100 block of Grant Street. FRANKLINTON — Town staff reported a wastewater spill, caused by grease clogging a sewer line. According to town management, about 500 gallons of untreated wastewater spilled into a tributary to the Cedar Creek. The spill was discovered the morning of Feb. 8 and lasted about 40 minutes. One of the businesses that has been a Louisburg landmark for nearly eight decades has a new owner. 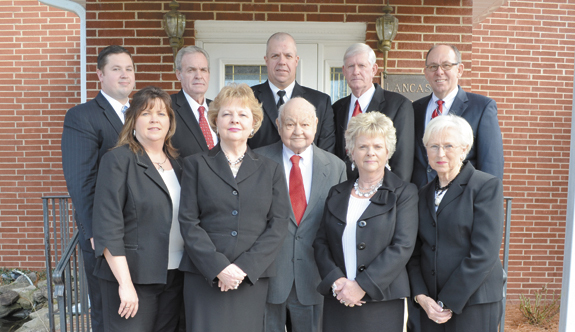 Michael Lyon, president and managing funeral director of Watkins-Cooper-Lyon Funeral Home in Clarksville, Va, and his wife, Jane, have acquired Lancaster Funeral Home.